I hope the replacement has a spine and a scrotum. on FOX now; Jeff Sessions has resigned. Last edited by SaltwaterSlick; 11-07-2018 at 02:24 PM. Should have happened months ago. He is the reason the Russian witch hunt is still going. And his leaving may be the end of it. Trump's done playing nice with the swamp dwellers. You better look out, Pelosi, it's about to get real. He turned to be a BIGLY disappointment. I think the House will take it up now.. Please Jesus, call Trey Gowdy’s name mr President. Good, I didn't like Obama or Holder but I can say one thing Holder had Obama's back and would of never recuses himself. 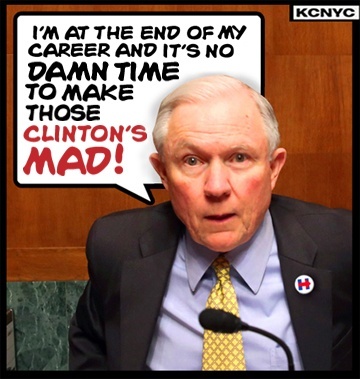 Sessions was a good politician but just wasn’t the guy Trump had envisioned for the job, right guy wrong time sort of thing in my opinion. He wants somebody that will stand up to the BS and have his back when the dems pull their stunts. Rumor has it, could totally be false... graham to AG and Haley replacing him as senator. I don't think Graham will take the AG job. He is next in line to chair the senate judiciary committee, a most powerful position where he can do much more good to keep the house dems in check and maybe some of them sent to jail. I like Trey Gowdy for AG but don't think he will take the job either. I also like the temporary AG. Technically the temp AG isn’t qualified to be acting AG. He wasn’t Deputy AG nor senate confirmed for his current job. I saw an article that said Trump is considering Chris Christie for AG. That is just Christie trying to stay relevant. Dan Bongino was saying she would be better on the Supreme Court. If he appoints anyone from California he's bat crap crazy. Brown & Sessions are both from Alabama? Brown moved from Alabama to CalifornIA. Whatz up with that? So does he know the guy or not?